An epic five-day snow storm could drop as much as 8 feet of snow on Tahoe ski resorts. The parking lot at Alpine Meadows ski resort Sunday morning was indicative of the snow Tahoe ski resorts received over the past two days. Several Tahoe ski resorts are reporting nearly 3 feet of snow since Friday night and the snow is falling heavily Sunday (Feb. 3). The National Weather Service (NWS) in Reno is forecasting up to 1-2 feet of snow Sunday and 2-4 feet more before the storm is expected to subsite late Tuesday afternoon. Sugar Bowl ski resort, which had 16 inches of fresh snow Sunday morning, was seeing heavy snow Sunday and summed up the feelings of most Tahoe ski resorts. “It’s dumping,” was the brief message on the Sugar Bowl website today. The bad news is most Tahoe ski resorts are experiencing high winds, are having avalanche concerns, and are shutting down lifts. The conditions are making it a difficult day for skiing and snowboarding. Also being impacted by high winds was Squaw Valley Alpine Meadows. At Squaw Valley on Sunday, a twitter message stated that “Gold Coast and Shirley Lake are currently on wind hold and the Funitel remains open for Mountain Run only.” Squaw Valley Alpine Meadows reported 14 inches of new snow Sunday morning. Avalanche danger remains high today, as determined by the Sierra Avalanche Center, and that danger will likely persist through Tuesday. As a courtesy to skiers and snowboarders, Squaw Valley Alpine Meadows was urging its guests to read Deep Snow, Powder and Avalanche Safety Tips before hitting the slopes. Both Sierra-at-Tahoe and Kirkwood Mountain received the most snow of any Tahoe ski resort from Saturday to Sunday morning, reporting 28 inches. 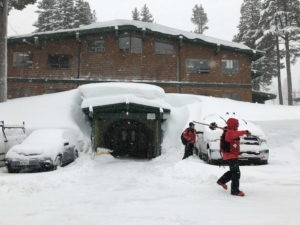 Kirkwood had a two-day total of 34 inches and Sierra-at-Tahoe wasn’t far behind with 32 inches from the storm. Homewood Mountain got 24 inches by Sunday morning and is reporting a 30-inch storm total. The Homewood website was cautioning “skiers and riders to expect snow showers throughout Sunday with temperatures in the 20’s and winds of about 15-20mph. Boreal Mountain was also reporting a huge amount of snow this morning with 20 inches and 26 inches since Friday night. Homewood Mountain got 24 inches of snow by Sunday morning and is reporting a 30-inch storm total. Northstar California received 15 inches overnight. After avalanche mitigation was completed Sunday morning, Northstar opened its popular Lookout Mountain and the Backside lifts. 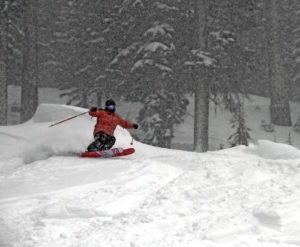 Northstar was predicting as much as 3 feet more of snow today. A winter storm that began Friday evening really intensified Saturday and dropped more than 2 feet of snow at several Tahoe ski resorts and could bring another 6 feet to the high country by Tuesday afternoon. The NWS is predicting that Sunday will bring a mix of heavy snow and strong wind, which could cause blizzard conditions Sunday night through Monday. Winds could be 50 mph with gusts as strong as 100 mph over Sierra ridges Sunday and Monday.